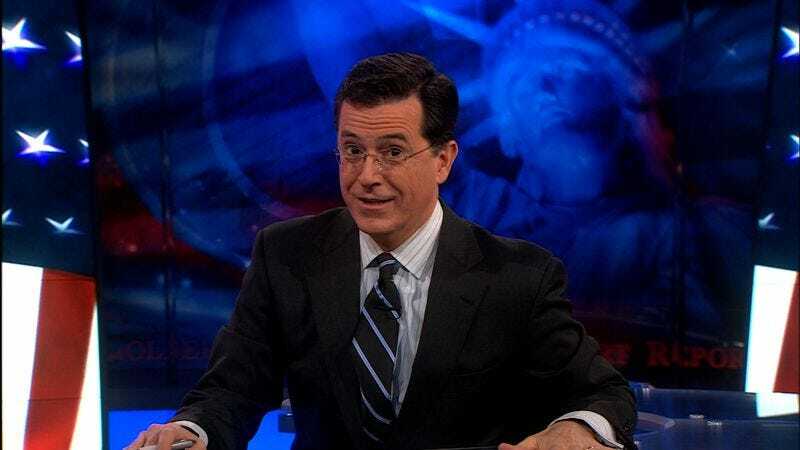 Following the established tradition of drawing attention to things that might otherwise be ignored were they not named after Stephen Colbert, Northwestern University drew attention to a thing that might otherwise be ignored by naming it after alum Stephen Colbert—specifically the "Colbertian" language, which was invented for the purposes of important linguistic research and getting talked about because it's sort-of related to Stephen Colbert. The study focused on whether those who were already multilingual may find it easier than monolinguals to learn a new, invented language, and whether this could then be passed off as national news if somehow Stephen Colbert was tangentially involved. According to the findings and the fact that we're writing about this right now, both hypotheses proved correct: Multilingual subjects had a much easier time than their monolingual counterparts with processing Colbertian—a group of made-up words like "shundoe" and "lateep" that were related only in spirit to Colbert-spawned words like "truthiness" and "Lincolnish"—and then people like us reported on them, thereby fulfilling the researchers' goal to " draw attention to the study by using Stephen Colbert’s last name." It still remains to be seen whether the study may also produce the breakthrough of finding a cure for Northwestern University linguists not getting talked about on The Colbert Report, but these early results are certainly promising.